TERHATHUM, Sep 10: Terhathum’s Hyatung Waterfall, the tallest in South Asia, is fast becoming a destination for the backpackers. The surge in the water volume in wake of the monsoon’s downpours has become an added flavour for the thrill seekers. The people thronging the waterfall located at Phedap rural municipality are known to take pleasure in the surrounding natural beauty. The visitors particularly relish playing in the water cascading down on them. 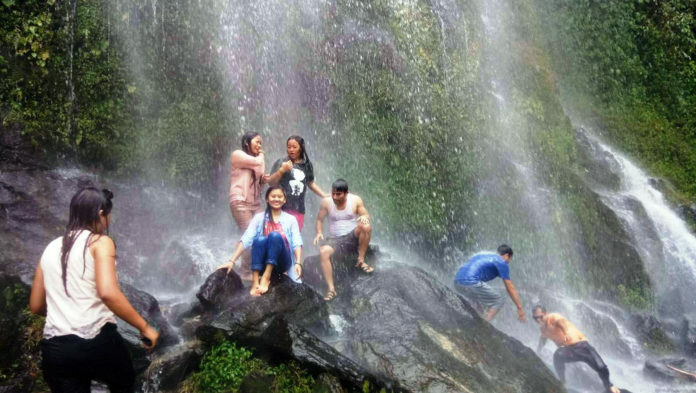 More than 200 visitors from various districts visit the waterfall on a daily basis, said Hyatung Waterfall Unity Society Chairman, Ram Timsina. The concerned authorities are yet to get their head around over the need to built tourist infrastructure and promote the destination. Due to the failure on part of the local authorities to upgrade the rural trail route visitors are forced to walk on foot from Aaathrai and Phedap rural municipalities to the waterfall.